MCC Glen Iris Valley Tennis Club and Vida Tennis would like to congratulate Jaimee Fourlis on winning the Australian Open Wild Card Play Off. In doing so, Jaimee will be playing in the 2017 Main Draw Women’s Australian Open, her first Grand Slam at the age of 17. Jaimee has been a long term member of the club’s Premier League team and started tennis with our club coaches at Vida at the age of 5. It will be great to have a club member to support and following during the summer of tennis. We will keep you up to date with when she plays and as always wish her the best. Unfortunately, our number 1 men’s player from our Premier League team, Blake Mott, went down in the semi-finals and will need to get through the qualification event. Matt Reid will join Jaimee in the Australian Open playing doubles with JP Smith. 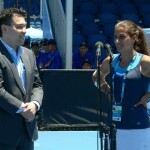 Below is a recent article after Jaimee won her wild card from Tennis Australia. Last weekend, Jaimee Fourlis wept after falling in the 18/u Australian Championships final to Destanee Aiava, having missed her shot at an Australian Open wildcard. Eight days later, she gained a second chance, and grabbed it with both hands. The 17-year-old Melburnian secured berth in the main draw at Melbourne Park in january after winning the AO Play-off final against Abbie Myers. Fourlis came out on top of the scrappy, tense match 7-6(6) 7-5 after, quite simply, playing the big points better. 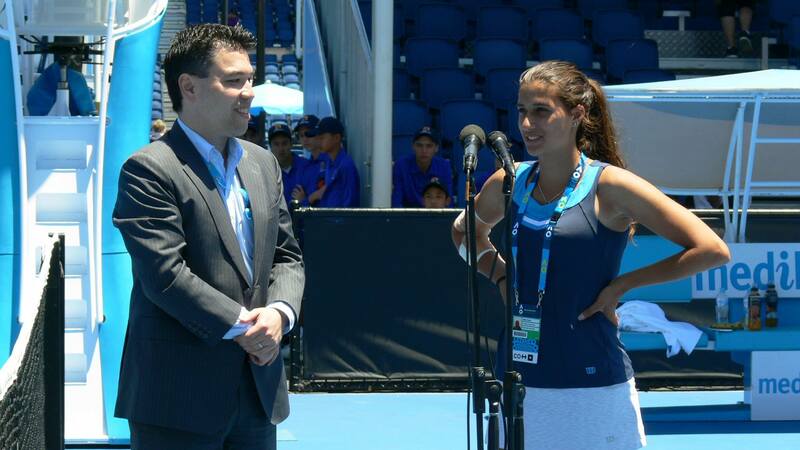 “It’s a pretty surreal feeling to be in the main draw of the Aussie Open. Doesn’t really happen every day so it’s an incredible feeling,” she said. Myers had plenty of chances in a match that featured big swings in momentum and peaks and troughs in quality. The 22-year-old led 4-2 in both sets and spent a lot of the match bullying the younger Fourlis about the court with big serves and heavy forehands. The aggressive Fourlis, unaccustomed to being forced onto the back foot, got frustrated as she struggled with her range and her ball-toss in the sunny yet breezy conditions. But she inserted herself back into the match, and when facing a set point in the tiebreak, saved it with a forcing forehand that drew an error from Myers, and then took the opener when she hooked a forehand crosscourt for a winner. Myers broke immediately in the second set and again built a 4-2 lead, but Fourlis roared back to win five of the next six games. Vocally urging herself on after holding for 6-5, the teenager landed a succession of returns within centimetres of the baseline in the final game and benefitted from a rash of Myers errors to clinch victory. “Credit to Abbie – she played some very solid tennis,” Foulis said after the match, which was watched by Thanasi Kokkinakis, Alex Bolt and head of women’s tennis Nicole Pratt. “I just had to stay solid and play my game. Just compete very hard because I know that she competes well as well. Fourlis, who just completed Year 11, said she had barely considered what her first experience of Grand Slam tennis would entail in January next year. She said she did not care who she drew in her first-round match, but that it could be fun to play another Aussie. She said she didn’t even know what her lead-up would look like in terms of tournaments. Her immediate focus was on enjoying a few days off and spending Christmas with her family before her mind turned to what will be the biggest month of her fledgling career to date. “It would be an amazing feeling playing in front of the home crowd,” she said. 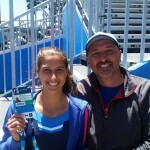 Jaimee with her father Bill after the match!